My name is Lanni Lantto and I am a fashion (re)designer. The difference between myself and other fashion designers is the concept of my label name, “(re)”; reuse, reduce, redesign, rethink, reinvent, recycle. My entire creative design process is unconventional from start to finish. I thrift for my materials instead of buying new fabric yardage and I marry wedding dresses with table runners and garters with suit coats. With no material off limits, inspiration can come from anything … creating truly extra-ordinary clothing. UPcycle It! By using pre-existing materials & creatively salvaged fabrics, I breathe new life into fashion otherwise destined for the landfill. 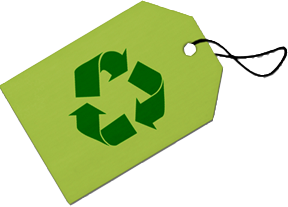 After all, the most eco-friendly fabrics are those that already exist. I am committed to creating a shift of consciousness by sourcing all 2nd hand materials locally, using reclaimed sewing materials (even mannequins), & displaying my pieces with recycled tags and on salvaged clothing racks. I’m proud to be a designer who supports my local economy through a business that essentially creates no new waste. This is why I not only create clothing but I teach people skills to reconstruct their own wardrobes and offer personalized wardrobe eco-consultations. There is no need to buy new clothes. Everything you own can be redesigned. All you need are the skills to see old materials in a new light. I can help you do this. Whether you make a commitment to buy one (re) piece instead of buying new or I give your closet an eco-make-over; YOU have the power to make a huge difference. (Re)designing is a necessary component of living a sustainable lifestyle and a wildly adventurous way to honor and respect our world! I’ve taken an unconventional path to a non-traditional career. I am not a fashion designer going eco; I am an environmental & social activist gone fashion designer- and rather than being a set back I believe it actually sets me apart. I thought I had to be behind a desk to be an activist, making phone calls, networking, writing my thesis, teaching at university- what I discovered is that a (re)volution of the heart can come from anywhere; including through the art of fashion. (re) collections consist of (re)constructed clothing & accessories for sale in boutiques & available on-line, as well as one-of-a-kind custom made garments for clients. Having been originally inspired by the beauty of my grandmother’s hand-stitched lace slips, I mainly work with soft feminine materials like lace & satin that come in the form of nightgowns, slips, & lingerie. Mixing delicate fabrics with harsh bold lines and asymmetrical cuts brings out a bold, confident lion/ness. Blending these two opposite yet connecting energies into one, balances the wearer and (re)vigorates the synergy of the Earth. ( re ) collections are composed of 100% upcycled pieces. ( re ) shows a different & unique side of upcycling. Aimed at not only (re)transforming the material into something better but at inspiring a society that (re)thinks their choices as consumers. ( re ) has been educating communities in Europe, Asia, & the U.S. through wardrobe (re)design workshops which combine awareness of ethical fashion issues with (re)fashion exhibits. ( re ) aims to bring upcycled fashion further mainstream and to propel the green movement forward through eye catching and popular means. Getting (re) pieces on the Red Carpet is Step #1. Let’s change the world… one consumer at a time. (RE) embodies all that I stand for. The mission of the message is to encourage people to rethink their clothing choices and for manufactures to restructure the way they do business. Having consumers rethink their clothing choices is done by presenting people with more options. (re) is just one of the faces for what Upcycled Clothing looks and feels like. Getting Upcycled Clothing in the hands of stylists to be used on celebrity clientele & in TV/Films is a streamlined approach to make eco-fashion a viable choice of influence. 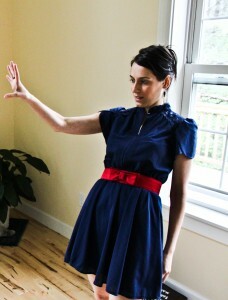 (re)’s closet eco-consultations show people what is possible in their own wardrobe making the experience very personal. Generating media exposure through TV Spots & Interviews makes a private consultation instantly experienced by thousands of people. Influencing the fashion industry to restructure the way they do business is done by presenting them with alternative means to operate. (re)’s webseries teaches fashion designers how to incorporate sustainability into their methods of designs. (re)’s Network TV Show (treatment & sizzle available) connects textile manufacturers and corporate businesses with upcyclers who can increase & green their profits while dramatically decreasing their carbon footprint. The overall desired outcome of (re)’s entire message is that we can all have a better quality of life. That is what upcycling is. Taking something that currently exists and making it even BETTER. This isn’t about having something taken away from us, it is about consuming and creating in a way that is even more enjoyable! It’s about enjoying fashion without the guilt of spending too much or being embarrassed about how much is in your closet that you don’t wear. It’s about having more choices available in the places that you shop to purchase ethically made clothing. It’s about educating ourselves on what “Made in Bangladesh” means and wanting to improve others’ life conditions. It’s about diverting ourselves from the path of gloom (pesticide poisons, pollution & limited resources) to BLOOM that celebrates human beings’ ingenuity and creativity. It’s about awakening to the (re)ality that all of this is possible right now if we could just see the options and alternatives! (RE) exists to connect upcyclers and bring the upcycling movement mainstream. Upcycling is a world-wide movement that is based on working together to reuse materials in each of our local areas for the overall betterment of the Earth and everyone on it. It goes against the traditional competition-based models of how to do business and presents a more egalitarian alternative. It is a pooling of our talents so that we can all be of service to people in need while creating a means of survival for those who specialize in the trade. Upcycling is bigger than a job, it is a calling – and one the world is in desperate need of right now. If you agree, come join me and let’s do this together!